Education is an integral part of American Agri-Women! View and Download Coloring Book! The American Agri-Women (AAW) believe in a public educated about modern agriculture because an increased knowledge of agriculture allows individuals to make informed personal choices. Our members believe that informed citizens are able to participate in establishing the policies that will support a competitive agricultural industry that can sustainably produce food and fiber for a growing population. 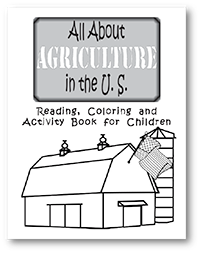 AAW is dedicated to increasing Agricultural literacy for current and future generations. Agricultural literacy is defined as: an understanding of agriculture’s history and current economic, social and environmental significance to all Americans. This understanding includes some knowledge of food and fiber production, processing and domestic and international marketing. For more information about AAW educational activities please contact: education@americanagriwomen.org. We are a force for truth, a reasoned, non-partisan voice for the agricultural community to the public. AAW’s 2019 Legislative Fly-In will be in Washington D.C. on June 9-12, 2019. AAW’s 2019 National Convention will be in Tigard, Oregon on November 6-10, 2019. Copyright © 2019 American Agri-Women. All rights reserved.